I am a huge fan of Korres. At the top of list of faves is their Wild Rose Facial Oil, as well as their Black Pine Serum. I didn’t think I could love the brand until I attended their Brand Day a while back. Brand Expert, Steven Cannizo lead the event taking attendees through brand’s origination to their ethos. Tapping into the unique power of Greek flora they’ve developed a new product. The all new Golden Krocus Elixir is aimed at the 40 plus age range and is suitable for all skin types. The Golden Crocus Elixir is a multi-faceted product that targets wrinkles, dull and dehydrated skin. 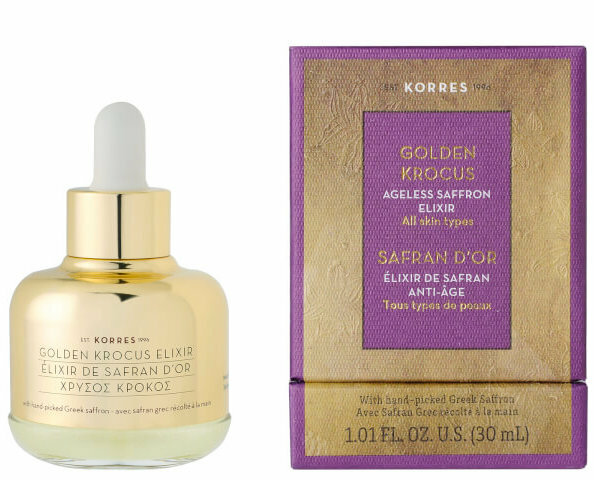 The key ingredients in the Korres’ Golden Crocus Elixir are: Day fresh Organic Greek Saffron, Amino Acid Copper Complex and Low Weight Hyaluronic Acid. Korres says that results can be seen after 14 days of using the product and after four weeks visual signs of ageing are decreased. I tried out the product for three weeks. At the start of the trial my main concern was hydration. Golden Krocus comes is a luxurious golden bottle with a pipet application. I used it in the morning before my moisturiser and sometimes at night on its own after cleansing but never twice daily. On average I used one and a half pipet drops. Firstly, the fragrance was divine. As with all Korres products it made me feel soothed and ready for a botanical spa-like experience. The Elixir had a pearlized sheen to it. The consistency was runny and ultra-light weight. I totally enjoyed using the Elixir. It absorbed very quickly into my skin making it feel smooth, supple and hydrated. Best results were achieved at night, perhaps because I use cleansing products during that time. In the morning I washed my face with water only. Golden Krocus improved my dehydrated skin and gave it a youthful glow.